The cornea is normally the transparent “windshield” of the eye, serving to protect the internal structures of the eye while allowing light to enter for vision. The endothelium is a single layer of cells that lines the inside of the cornea. Though only a single cell layer thick, this layer is vital in maintaining a clear cornea for functional vision. The cornea normally maintains its clarity through a number of factors, including a very regular arrangement of supportive ﬁbers and a relatively dehydrated state compared to other body tissues. If water is allowed to build up, the corneal ﬁber arrangement will be disrupted and the clarity of the cornea will be reduced. Endothelial cells in most domestic animals are not able to repair themselves. Therefore, if cells are lost, the remaining cells attempt to spread out to take the place of the lost cells. As long as the number of functional endothelial cells remains above a critical threshold number, they will be able to prevent a gap in this lining and successfully keep the cornea clear. If the number of cells falls below this threshold, or if the cells become unhealthy, they will no longer be able to keep the entire cornea dehydrated and clear. The result is a progressive blue cloudiness that develops across the cornea. This situation can develop due to an inherited condition in certain breeds, such as Dachshunds, Chihuahuas and Boston Terriers. In these breeds, the condition is referred to as endothelial dystrophy. It can occur spontaneously in these dogs without an inciting cause. Endothelial degeneration also occurs following death or damage to the endothelial cells as a secondary disease to many intraocular disorders. These can include severe inï¬‚ammation (uveitis), elevated intraocular pressure (glaucoma) or mechanical damage due to a luxated lens. Fluid accumulation within the cornea is not a painful condition by itself; however, this ﬂuid can sometimes cause the formation of small “water blisters” in the cornea called bullae. If these bullae reach the surface of the cornea and rupture, they will leave a painful corneal ulcer. These ulcers can heal quickly with appropriate medications but, if they become a recurrent problem, we may recommend a surgical procedure to help minimize bullae formation and heal the erosion. This condition cannot be reversed with topical medications. 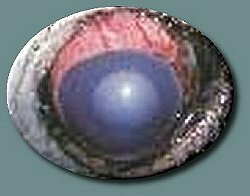 However, treatment often begins with a topical hyperosmotic, non-irritating salt ointment, which may help to draw out the excess ï¬‚uid in the cornea. The amount of time that this ointment will be used depends on your petâ€™s individual situation. Other eye medications that may be used include anti-inï¬‚ammatory drops to reduce inï¬‚ammation inside of the eye (uveitis) that may be contributing to the loss of endothelial cells. Topical antibiotic drops should be used if corneal ulcers are found. If corneal bullae and ulcer formation become a recurrent problem, we may recommend one of two procedures, “Laser Keratoplasty” or “Thermokeratoplasty”. These procedures are designed to use concentrated energy, or heat, to create a layer of scar tissue within the cornea. These procedures typically do not help improve the clarity of the cornea, but rather stimulate healing of corneal erosion. With fewer ulcers, your pet will be more comfortable and will require fewer eye drops. Some of these complications can lead to patient discomfort or blindness.